NVIDIA announced quarterly earnings for the company’s second quarter of Fiscal Year 2014 last week. Their Tegra business slumped while the official spotlight is on “record margins”. For the conference call transcript, it’s accessible here on Seeking Alpha (registration required). The company earned $977.2 Million for the quarter with a net income of $133.3 million, $0.23 per share. The gross margin is at 56.3 percent, the company cites the GPU business gains due to a richer product mix (read Kepler-based Quadro and Tesla products) as the reason for obtaining record margins. Revenue for the GPU business is at $858.6M (up 9.3% sequentially, and up 7.5% year-on-year), with most segments having healthy gains. Desktop GeForce segment had a 13.8% gain sequentially, while the gain for Quadro segment revenue was 8.5% sequentially, and an increase of Tesla revenue 25.3% sequentially. NVIDIA says the gains in Tesla were attributed to open markets, small installations and smaller clusters, i.e. corporate buying cycles. So far so good, right? Well, maybe not. For the past quarter, Tegra revenue was a mere $52.6M even with automotive sales to save the day, a slump of 49% sequentially, and a more disastrous 70.7% decrease year-on-year. The official explanation being that the quarter is the transition period from Tegra 3 to Tegra 4 devices, in which the partners ramped down their Tegra 3-based products while they are still ramping up Tegra 4. Additionally the company pulled in Tegra 4i by 2 quarters at the expense of pushing out Tegra 4 by a quarter. Purportedly “Logan“/Tegra 5 was also pulled in and thus an expected tough quarter for the Tegra business. It is a very complex subject to quantify but as NVIDIA stated in their CFO commentary, the company is still building up inventory of Tegra 4 (notice that it’s not Tegra 4i, but Tegra 4, as the new models, both integrated modem and discrete form, are still being validated) “in advance of customer shipments”, such that inventory stands at $378.3M, a 2.2% increase compared to $370.1M inventory for Q1, while the Days Sales Of Inventory (DSI) has gone up to 80 days compared to the 77 days figure for Q1. On the other hand, Microsoft bit themselves and NVIDIA very hard with the Surfact RT and WART, with Microsoft writing down $900M worth of Surface RT tablets earlier in July. From Office RT bundling to putting OEMs at a severe competitive disadvantage, the eventual price cut just make things worse. At this point onwards, every single WART backer from the OEM side including ASUS, Acer, and Lenovo, quit. Only Microsoft and NVIDIA remained to publicly carry the WART torch. While Jen-Hsun Huang was honest enough to admit a certain platform performed worse than expected in the conference call, he then proceed to tell people in an interview a few days later,that they are working hard on Surface RT 2 tablet. This will bring Outlook to WART and will somehow change everything. If you listen to the call however, this doesn’t mesh with Jen-Hsun’s statement about the platform not coming back. So Zune got a few iterations (Zune HD, for instance) before it finally got killed off so one might expect similar path along the death spiral for the Surface RT series of tablets. One thing is common between these two, is the lack of unique applications, content, and personality available to the device compared to respective competitors. Moving onto “Logan“/Tegra 5, the company has high hopes about it and is not being shy in showing their pride. 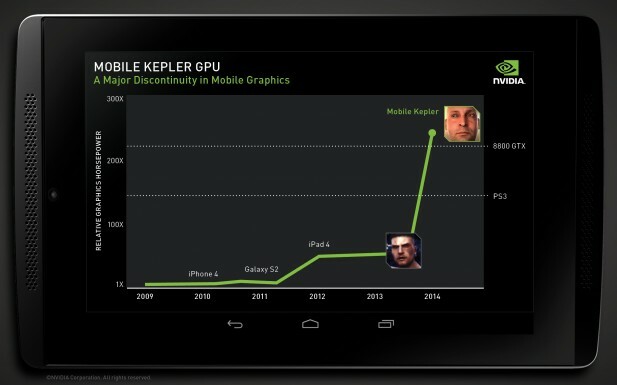 “Mobile Kepler” is about 20x the performance of a GeForce GTX 8800. 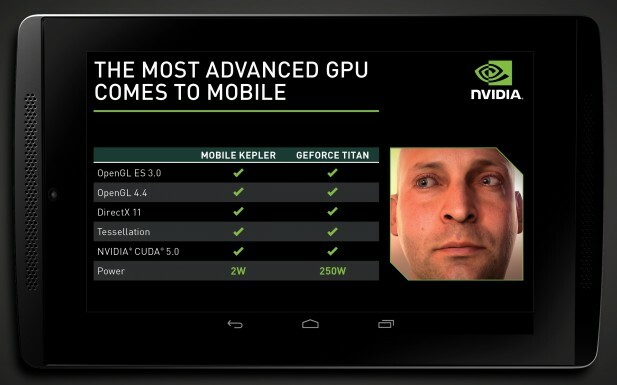 Despite their demonstration of the “Logan“/Tegra 5 SoC two weeks prior to the earnings release, claiming the SoC is now sampling to partners, and boasting comparable visual quality against the GeForce GTX Titan while having way better energy efficiency, the worrying sign would be the suggested news about “Logan“/Tegra 5 getting into an 7-inch NVIDIA-branded tablet. Like Tegra 4’s introduction, there was a telling lack of third-party devices. Any vendor that puts out a white box device is instantly competing against their OEM base, and given the massive competitive advantages the silicon vendor has, it essentially means no serious OEM will buy the chips. No chipmaker would put out a reference design like Nvidia did with Tegra 4 and soon Logan/Tegra 5 if there were any actual customers for the product lined up. We also remain skeptical about the power draw of this 28 nm little processor, until the concerns for a cherry-pick sample being used for the demo session have passed into market available chips to test. But wait, there is more on the table during the conference call. What about the projections on NVIDIA Shield sales? In light of the 3.6% sequential decrease in notebook GeForce revenue, how about the shock setting in with the next Apple MacBook Pro getting a special “Haswell” in it and no discrete GPU? When asked about notebook growth, here’s what Jen-Hsun had to say. Dodge! Further, when asked on projections on whether or not Tegra 4 sales will ramp to equal or greater than Tegra 3 and GeForce OEM segment performance, these two questions were also dodged as well without any direct or indirect answers given.